This list and the list that follow are only introductory books and in no way should be considered to be exhaustive. Gaia's Garden, A Guide to Home-scale Permaculture, Hemenway, Toby, © 2000, Chelsea Green Publishing Probably no finer introductory book on permaculture is available. More easily digested than the others in this list, this is still a comprehensive guide and is easily one of the more readable books on permaculture. 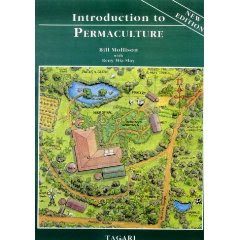 Introduction to Permaculture, Mollison, Bill © 1991 Tagari Publications (Photo above) IF you can find it for less than $149 (its current asking price for a used copy on Amazon) this is a lovely book that lives up to its name, an introduction to permaculture. 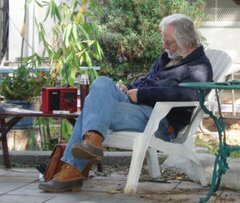 Mollison, along with Holmgren, founded the concepts of permaculture. Because it is so old, it is somewhat dated, but Mollison writes in a way that is readable, digestible and it is well illustrated with drawings. Permaculture, A Designers' Manual, Mollison, Bill © 1988 Tagari Publications, Dense. Out of Print. The most exhaustive text on the subject ever written. Will likely never be attempted again. If you can find it, and if permaculture, is your bag: Indispensable. (I borrowed my copy.) But indispensable as historical data – we know a lot more now than Mollison knew then. This book works best as background – to REALLY design something today, look at other books. Permaculture, Principles and Pathways Beyond Sustainability, Holmgren, David © 2002 A more cerebral take on the permaculture 'revolution' who looks beyond the horticulture and agriculture beginnings of permaculture with the intent of applying the concepts to other aspects of human society. Probably your book if you think you'd like to design a permaculture career. The Basics of Permaculture Design, Mars, Ross © 2005 Chelsea Green Publishing This is a dense manual. The upside is that it contains all the basic design ideas and principles and is wonderfully illustrated. The down side is that there is more data on one page than in a chapter in other books. This density makes for tough reading, but that isn't all bad. It is the most current in this list.